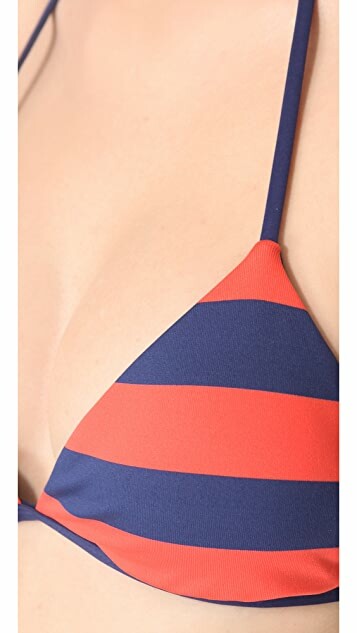 A reversible bikini top in bold stripes. Ruching textures the triangle cups, and the spaghetti straps tie behind the neck and at the back. Removable padding. Solid lining. this top is very secure with great material. with this price, it is a steal!!!!!!! I don't know if I missed that on the description, but the top is reversible! Which is fabulous as it changes the look quite a bit, and makes me feel like I am wearing a completely different suit. I wear a 34aa and the small was pretty on point. With the little padding inserts, I even look like I am a little endowed.